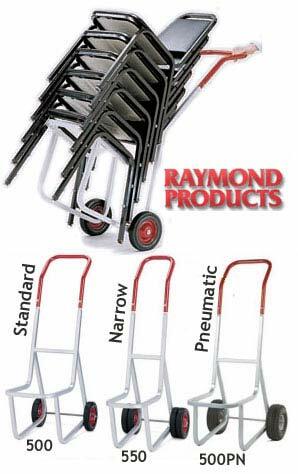 Move up to 16 standard chairs at a time with Raymond stack chair dollies, eliminating costly and tedious hand carrying. The sensible solution to quick and easy setup time for seating at banquets, lectures, conventions and meetings. Tough and durable, the Stacked Chair Dolly accommodates most types of stack chairs. Heavy-duty steel frame with bonded vinyl handle. A real time-saver. Two 8" x 13/4" skid-resistant rubber wheels. Powder coated gray finish base.